Cat Foley-Wray was a convincing winner of the 3000m. 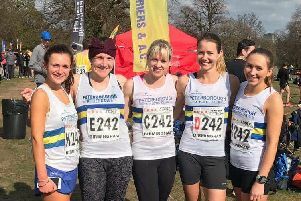 Southern League Division One champions Nene Valley Harriers began the defence of their title with a home win at the Embankment on Saturday. They took on the two promoted teams who dominated the second division last summer and also the only club to beat them in 2015 yet still emerged victors by over 30 points. Match result: 1 Nene Valley Harriers 215.5pts; 2 Radley AC 178pts; 3 Harrow 157.5pts; 4 Colchester Harriers 154pts. Sean Reidy and David Bush got them off to a promising start, dropping just one point in the 400m hurdles, and Reidy’s time of 57.7 for second place in the A race was a new Masters age group club record. Bush won the B race in 58.7. The Harriers men’s team then went on to dominate the flat track events, dropping just four points from 100m through to 1500m. Kane Wright grabbed two second places in the A string short sprints with 11.1 in the 100m and 22.3 in the 200m, and Ashley Sandall was runner-up in the 400m A race in 49.9. Then James McCrae, Max Butler, Alex Hampson and Oli Bowling turned on the power to attain the clean sweep over the middle distance events. Over 800m McCrae won the A race in 1.58.5 and Butler the B race in 2.02.0 and then over 1500m it was Hampson storming home first in the A race in 4.14.0 and Bowling winning the B race in 4.20.1. Martin Tinkler and Simon Achurch then led the way in the throws, banking maximum points for the shot putt and discus. Tinkler was the A string winner in both with distances of 13.92m and 38.76m. Ashley Barker was another A string winner, taking the high jump honours with 1.80m. To finish the day off, the 4x400m relay team of Sandall, McCrae, Butler and Daz Holding won comfortably in 3.30.1. For the ladies it was great to see Georgie Ivens back in action after a long injury lay-off and she clinched a 200m and 400m double win. She won the 400m A race in 57.2 and the 200m B race in 25.6. She was well supported in the 400m by Kelsi Ellis, who clocked a big personal best of 61.7 for first place in the B race in only her second outing over the distance. Cat Foley-Wray and Nicky Morgan ran strong races in the 3000m and scored maximum points. Foley-Wray dominated the event from the early laps and finished 19 seconds clear of the field. Other A string winners were Rosie Fresen in the pole vault with 2.50m, Becki Hall in the shot with 12.24m and Andrea Jenkins in the hammer with 47.50m, while the 4x100m relay team of Emma Hornsby, Emily Maltby, Lily Hughes and Alex Pullan won in 51.0.